Order Hello Kitty checks online. Hello Kitty Personal Checks, Hello Kitty Checks, Hello Kitty Calendars, Hello Kitty Cheap Merchandise from Ebay.com. 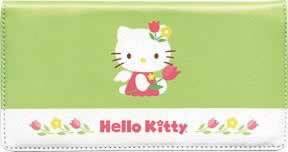 Enjoy these cute Hello Kitty® checks and labels, guaranteed to delight fans everywhere. Checks in the Mail, Inc. is pleased to present Sanrio's Hello Kitty® Check Designs. New Hello Kitty Checks are cheaper with Bonus Buy. Includes 1 box of single or duplicate checks, 20 deposit tickets, 144 matching address labels and a coordinating checkbook cover 2004 SANRIO CO., LTD. Used Under License. Our favorite pop culture character, Hello Kitty, jumps into springtime with this wonderful set of pastel floral designs. This series is destined to be a customer favorite. ©1976, 2004 SANRIO CO., LTD. Used Under License. Checks in the Mail, Inc. is pleased to present Sanrio's Hello Kitty ®, a world-famous pop icon bringing smiles to the faces of young and old the world over for 30 years. This genuine leather cover has a pink silk moire lining.